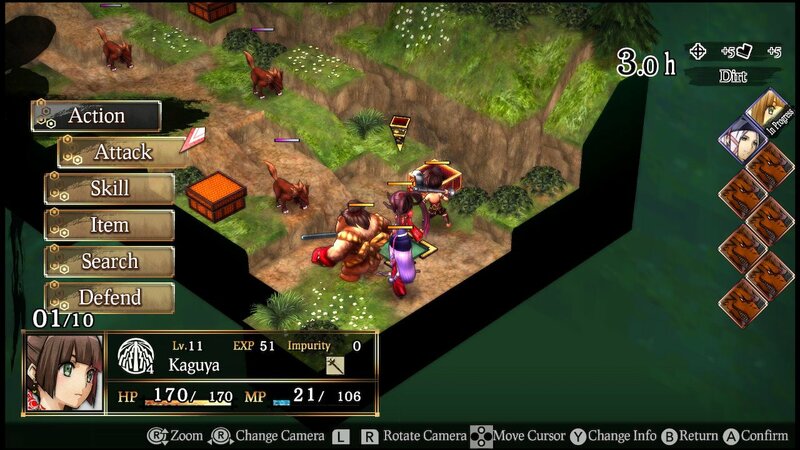 This is a tactical RPG that was previously released on PS4 and Vita. The Switch version has over 100 hours of new content and all the DLC from the other versions included, which a pretty sweet deal! How is the game itself though? Let’s find out! 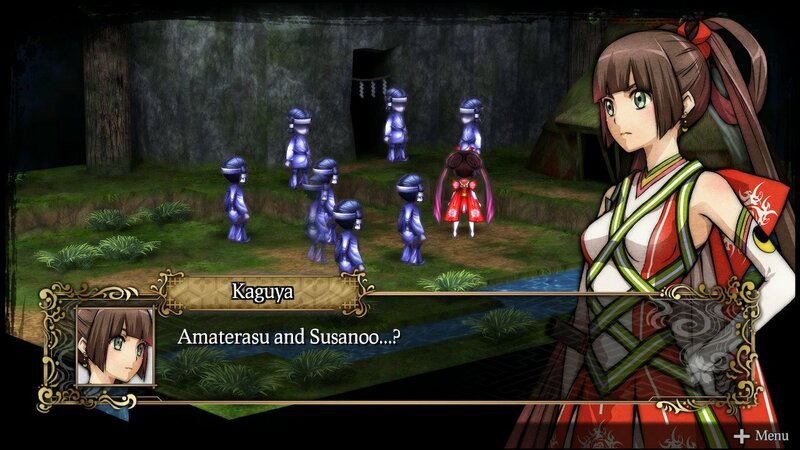 A look at a battle with Kaguya picking a move from the Action menu. 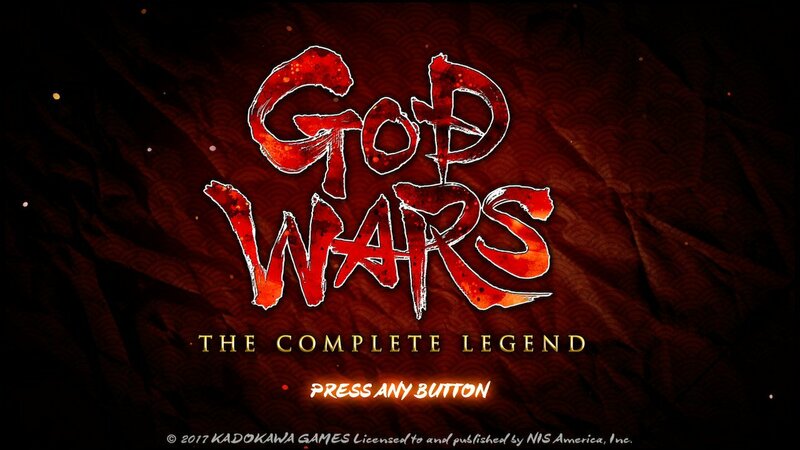 God Wars: The Complete Legend as said is a tactical RPG, which should be familiar to anyone who’s played games before like Fire Emblem Awakening/Fire Emblem Fates and/or Disgaea 5 Complete (which is also on Switch). Me, I’ve only played a tad bit of Fire Emblem: Path of Radiance and less of Fire Emblem Awakening. However, I find another game that’s compatible, though not an RPG, to be Mario + Rabbids: Kingdom Battle (check out my review!). The story begins when a queen has to sacrifice one of her three daughters to calm the gods. 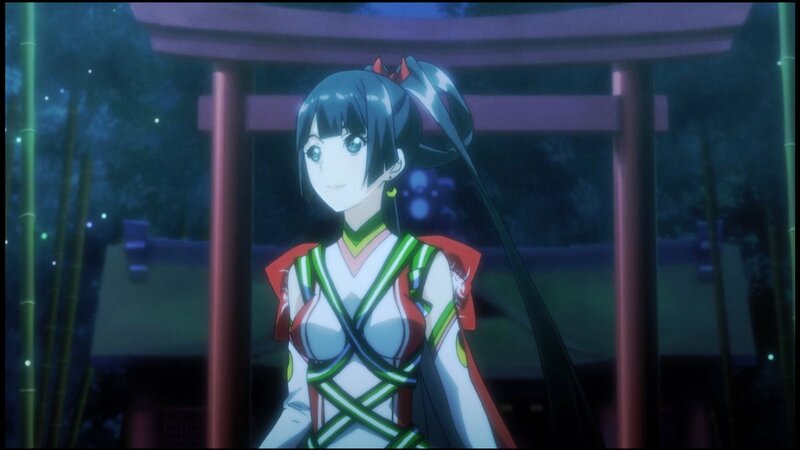 Years pass and we’re introduced to Kaguya, the 2nd of the daughters. She is rescued by a warrior named Kintaro and his big bear friend Kuma (Translator’s Note: Kuma means Bear). Kuma is a bear of very little words, who speaks lengthy and complex dialogues of “Kuma” and “Guma”. A look at a 2D animation early in the game. Upon being introduced to these characters, you’re then introduced to the tutorial. Gameplay works as you’d expect; you move your character as far as the limited squares on a grid allow. You can pick a single action which includes Attack, Skill, Item, Defend, etc. Attack uses a basic attack, where as Skill gives you a list of techniques that use varying amount of MP. Some heal, others act as support, and of course others do varying amounts of damage, and some are combinations! Items are self-explanatory. Some items include herbs to heal HP, Detox Tea to cure poison, etc. Defend lets you take less damage from an attack. Using any of the above ends your turn, so choose wisely. Character order goes by speed, so you have to plan ahead, rather than choose who goes first and so on and so forth, unlike Mario + Rabbids: Kingdom Battle. On the field there are boxes which can contain items for you to collect, but some might contain traps such as poison (but still give you an item anyway). Other spots include glowing patches of grass which Kintaro can use his “Gather Herbs” skill to, you guessed it, harvest herbs from. A cutscene only an Uchiha can love. One gimmick is height and direction. What that means is that if you’re on a higher tile than your opponent, you’ll do more damage, and less if you’re below them. Direction is where if you’re attacking the opponent’s side, you’ll do more damage than in front of them, and even more if you’re behind them. This of course works for your opponent as well. When each turn ends, you can pick which 4-way direction your character faces in anticipation of where your opponent will attack from. Next up is the Job and Skill system. Each character can have three jobs equipped, with two being custom and one being their unique job that can’t be swapped. You unlock many different jobs for characters as they level up (multiple characters can have the same jobs). Each job has their own sets of skills and skill trees, so you need to consider which jobs and skills are best for your situation. Upon using a skill, that skill gains experience and gives you job points for that job. 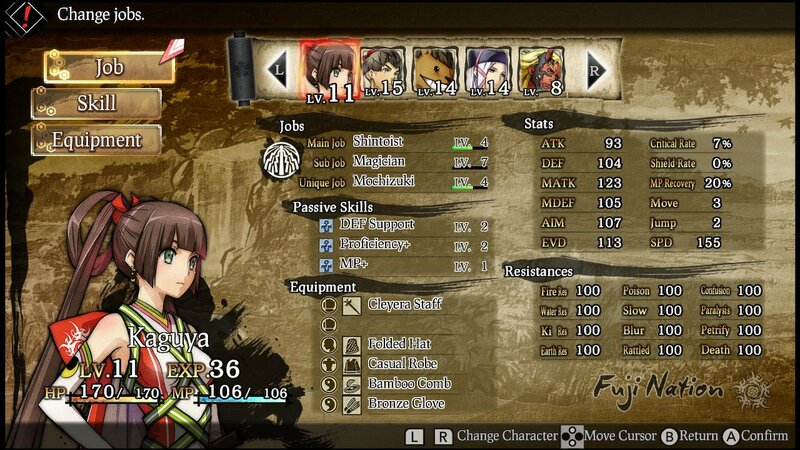 A look at Kaguya’s status screen. Skill trees use the job points to increase the level of a skill in each job. And if specific skills are at a certain level, the next set of skills in the tree are unlocked and can be used in battle. Increasing levels of course grants better damage, effects, and buffs. Some skills include damage healing, status healing, high-damage magic attacks, etc. Another kind of skill are passive skills. These include more permanent stat buffs, as well as earning more job points in battle, among others that work automatically in battle. These have to be equipped in your passive skill list outside of battle manually, and you can only have three active at once. You can use any combination of passive skills regardless of jobs used, so that’s very handy. It’s absolutely crucial to get a hang of these mechanics because the game doesn’t pull punches. If you’re not careful, you’ll get wailed on within a couple of turns. 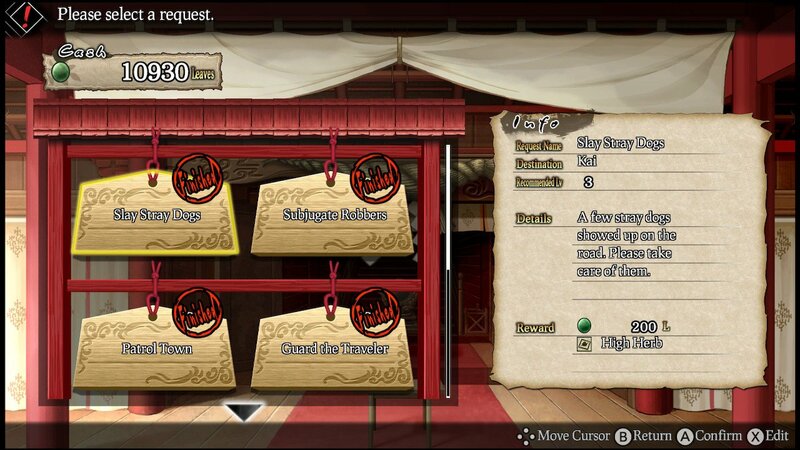 Grinding is possible thanks to request battles you can take after a few episodes in the first chapter at a shrine. You can just replay these ’till your heart’s content and gain a lot of experience and job points to really strengthen up, because you’ll need to, trust me. These are needed because you cannot replay episodes to play those battles again. 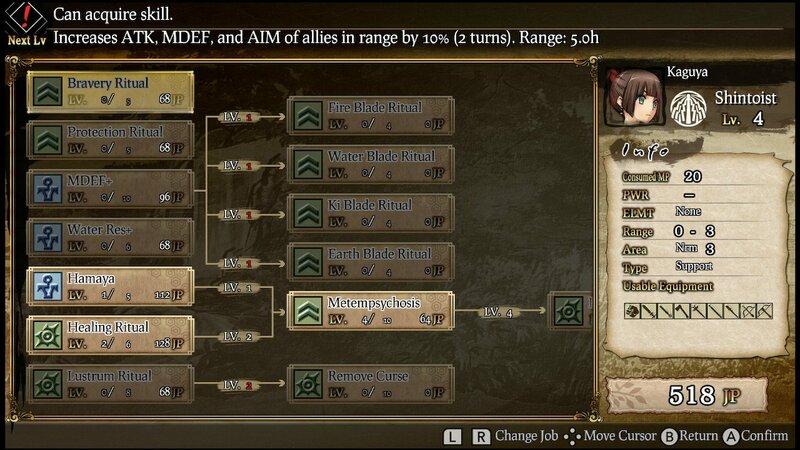 A look at Kaguya’s Shintoist skill tree. Visually it’s a tad mixed. The style is nice, but the game’s roots on Vita are extremely apparent (I’d even go as far to say that 3DS could handle the game honestly) with even the aspect ratio matching the Vita’s due to the black bars present. The character models are chibi like in Bravely Default and effects aren’t super amazing or anything. Resolution seems high enough (higher than 720p I assume docked). It runs at a locked 30fps which is good. It won’t win any awards for its visuals, but it gets the job done. Really only the far background/sky box looks legit low-res, even looking past the fake “depth of field” they’re going for, it looks pixelated. Audio is pretty good. Music is not the most varied, since literally the same battle song plays seemingly each time, so I hope you like it! 😛 Which I actually grew to honestly. A very nice bonus is that every bit of dialog (and I mean all) is fully-voiced in English and optionally Japanese. That’s pretty impressive since there’s quite a bit of it as well. Characters sound good for the most part, even if there’s a bit of ham thrown in at times. Here’s a shrine where you can pick requests to play over and over again. Overall I was surprised at how much I ended up liking this game. It took some time to get a hang of the mechanics, but once things clicked it really started to grab me. I legit recommend checking this out if you’re interested in a good tactical RPG. It’s not super special like Fire Emblem or anything, but it’s good as an alternative for now. Maybe it can be seen as a side dish when Fire Emblem: Three Houses comes out, decide for yourself! 😛 Oh and if you’re a fan of Naruto, be prepared to hear A LOT of familiar names and terms. It’s hilarious actually. I guess Naruto really took a lot from Japanese folklore and culture as a whole. + Visually it’s alright. Despite its Vita roots it holds up alright. The Japanese theme is well done IMO. + Music is good, though lacking in quantity. + Fully voice-acted in English and Japanese which is a big bonus. English voices sound good but not perfect. + Once you get into the swing of things the gameplay is legit fun and challenging. + Lots of jobs and skills to earn and use. – The Vita roots are so obvious, the screen actually has black bars on the sides that shows the Vita’s 960×544 aspect ratio (so it’s maybe 1271×720 as opposed to 1280×720). – If you get careless or are unprepared you’ll lose very quickly. – You can’t replay episodes. Grinding is only possible via the requests that are available. – Music needs more variety, especially the battle music.